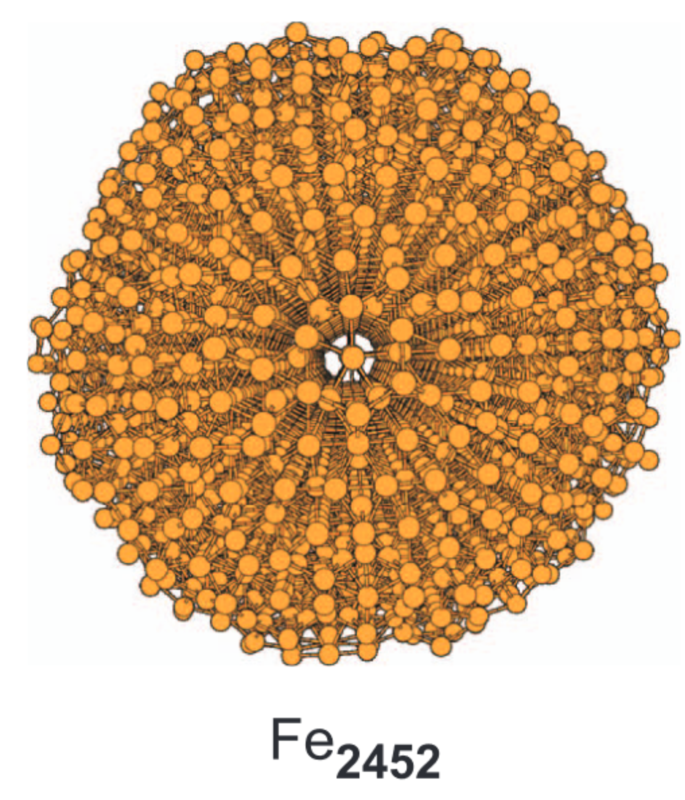 The study of the thermodynamics and structures of iron clusters has been carried on, focusing on small clusters and initial icosahedral and fcc-cuboctahedral structures. Two combined tools are used. First, energy intervals are explored by the Monte Carlo algorithm, called sigma-mapping, detailed in the work of Soudan et al. [J. Chem. Phys. 135, 144109 (2011), Paper I]. In its flat histogram version, it provides the classical density of states, g(p)(E-p), in terms of the potential energy of the system. Second, the iron system is described by a potential which is called "corrected EAM" (cEAM), explained in the work of Basire et al. [J. Chem. Phys. 141, 104304 (2014), Paper II]. Small clusters from 3 to 12 atoms in their ground state have been compared first with published Density Functional Theory (DFT) calculations, giving a complete agreement of geometries. The series of 13, 55, 147, and 309 atom icosahedrons is shown to be the most stable form for the cEAM potential. However, the 147 atom cluster has a special behaviour, since decreasing the energy from the liquid zone leads to the irreversible trapping of the cluster in a reproducible amorphous state, 7.38 eV higher in energy than the icosahedron. This behaviour is not observed at the higher size of 309 atoms. The heat capacity of the 55, 147, and 309 atom clusters revealed a pronounced peak in the solid zone, related to a solid-solid transition, prior to the melting peak. The corresponding series of 13, 55, and 147 atom cuboctahedrons has been compared, underscoring the unstability towards the icosahedral structure. This unstability occurs clearly in several steps for the 147 atom cluster, with a sudden transformation at a transition state. This illustrates the concerted icosahedron-cuboctahedron transformation of Buckminster Fuller-Mackay, which is calculated for the cEAM potential. Two other clusters of initial fcc structures with 24 and 38 atoms have been studied, as well as a 302 atom cluster. Each one relaxes towards a more stable structure without regularity. The 38 atom cluster exhibits a nearly glassy relaxation, through a cascade of six metastable states of long life. This behaviour, as that of the 147 atom cluster towards the amorphous state, shows that difficulties to reach ergodicity in the lower half of the solid zone are related to particular features of the potential energy landscape, and not necessarily to a too large size of the system. Comparisons of the cEAM iron system with published results about Lennard-Jones systems and DFT calculations are made. 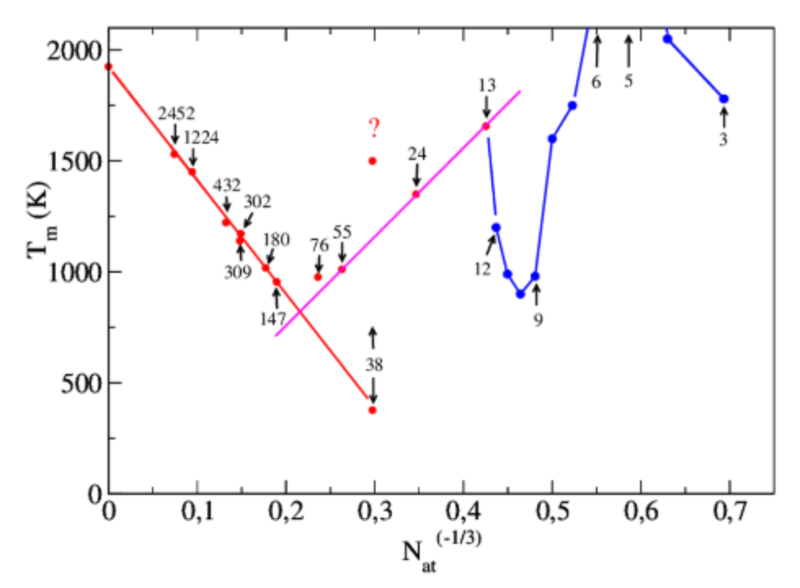 The results of the previous clusters have been combined with that of Paper II to plot the cohesive energy E-c and the melting temperature T-m in terms of the cluster atom number N-at. The N-at(-1/3) at linear dependence of the melting temperature (Pawlow law) is observed again for N-at > 150. 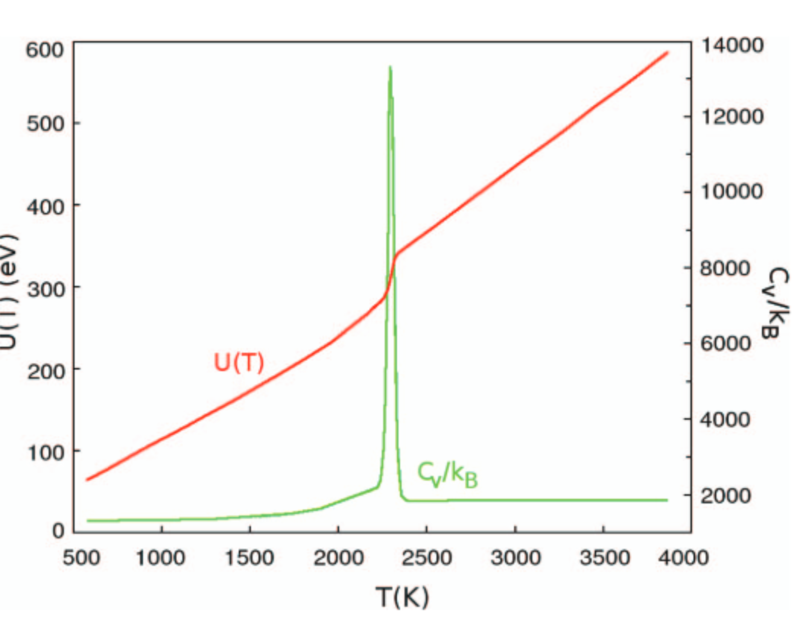 In contrast, for N-at < 150, the curve diverges strongly from the Pawlow law, giving it an overall V-shape, with a linear increase of T-m when N-at goes from 55 to 13 atoms. Surprisingly, the 38 atom cluster is anomalously below the overall curve. Published by AIP Publishing.